Integrated with the S-Bahn, the Hamburg U-Bahn is an important and comprehensive means of public transport in the city of Hamburg, Germany. This 104.7 km long network doesn’t confine itself to just the city of Hamburg, functioning in the areas of Norderstedt and Ahrensburg as well. Operated by the Hamburger Hochbahn AG, this metro system began operations in the year 1912. Currently, it operates along 4 lines, serving 91 stations in total. It’s ownership is split between the Hamburger Hochbahn AG and the Verkehrsgesellschaft Norderstedt. With an annual ridership of 218 million, it definitely stands out as one of the popular means of public transportation in Hamburg, as well as the other nearby cities. The metro starts operation from 4.30 am and runs until 1.00 am on Monday-Friday. The frequency between trains during day time is around 10 minutes. Before 6.00 am and after 11:00 pm, and on nights before weekends and public holidays, the frequency between trains is around 20 minutes. The fares for the tickets on the Hamburg U-Bahn, are zone based. There are various types of tickets available, from single purchase tickets to season tickets. The single tickets within the Greater Hamburg Area cost € 1.50 for a short journey and € 2.20 for a local journey. The 9 am day ticket is considered a good buy for those people who at least use the metro service twice in a day. Similarly the 9 am group ticket is popular as it allows for the travel of 5 people, at a cheap and consolidated rate. The 9 am day ticket costs between € 6.20-€ 16.40, depending on the zones of travel. Whereas, the 9 am group ticket costs between € 11.60-€ 26.00, again depending on the zones of travel. An important thing to note is that, with one 9 am day ticket, 3 children between the ages of 6-14 can travel for free with the fare paying adult. A normal single ticket for an adult ranges from € 3.20-€ 8.70. A ticket fee is applicable for children (6-14) too, costing € 1.20-€ 2.40 for a single ticket. Note: The offer of 3 children between the age group of 6-14 travelling for free is only applicable for certain tickets like the 9 am day ticket and the all day ticket for example. There are various types of season tickets that are available along with the single and daily tickets. They are mainly divided into 3 categories: Flexible weekly season tickets, Flexible monthly season tickets and the Abo-Karte All-year travel pass. Park and ride facilities are available at most of the stations serving the Hamburg U-Bahn. The service in general is for 24 hours and is free of cost. However there are certain park and ride facilities which are chargeable. All the stations have electronic passenger information systems, which provide information pertaining to route, lines, any service disruptions and stopping position of the next train and destination. Bicycles are allowed free of charge before 6 am and between 9 am to 4 pm on Monday-Friday, and all day long on public holidays and weekends. Two bicycles are allowed per car. The metro also offers wi-fi service and has staff to deal with lost property. With elevators throughout, some of the stations are completely accessible to passengers on wheelchairs. Hamburg U-Bahn consists of four lines serving 91 stations with a total length of the route of 104 km. All the four lines of Hamburg U-Bahn are recognized by its color and number. 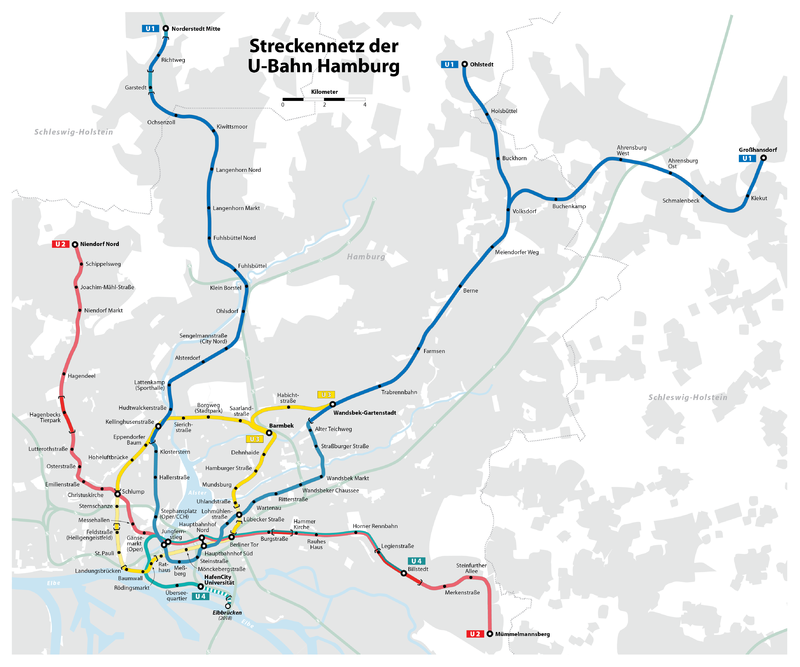 ● Hamburg U-Bahn U1– Line1 is blue in color and it operates between Norderstedt Mitte and Hauptbahnhof Sud – Ohlstedt. The line was first opened in 1914 and the length of the route 558 km serving 46 stations. The railway station on this route is built underground and Meb berg station was the first newly constructed underground rail line in Hamburg. ● Hamburg U-Bahn U2 – U2 line was first opened to public in 1913 and the line operates between Niendorf Nord –Jungfernstieg and Mummelmannsberg. The length of U2 line is 243 km serving 25 stations. ● Hamburg U-Bahn U3 – U3 line was opened to public in 1912 and the line operates between the routes Barmbek station towards Wandsbek – Gartenstadt station. The length of line U3 is 206 km serving 25 stations. ● Hamburg U-Bahn U4 – The U4 line was opened to the public in 2012 and the line operates between Billstedt stations to Hafencity Universitat. The length of U4 line is 122 km, and it serves 11 stations. In 2011, U4 line will be extended by one station towards Elbbrucken/Chicago Square.